Typical North Atlantic winter and summer profiles of sound speed versus depth are shown in Figure 2.6. 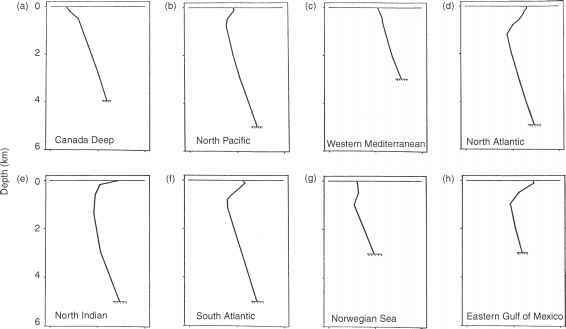 These profiles represent a region of the North Atlantic Ocean located near 23° N and 70° W (Naval Oceanographic Office, 1972). Temperature-salinity (T-S) diagrams for winter and summer seasons, based on actual measurements, are also presented to show their relationships with the sound-speed profiles. Since the T-S diagrams indicate the ocean depths corresponding to the measured T-S pairs, the individual temperature and salinity profiles for both winter and summer can be reconstructed. Principal water masses are also noted on the sound speed profiles. The so-called 18° water (refer back to Figure 2.5) marks a change in the sound-speed gradient at a depth of about 300 m, and Mediterranean intermediate water (MIW) occupies the region of the water column near the sound-speed minimum (at about 1,200 m). The sound-speed profiles in Figure 2.6 are representative of those encountered in many tropical and sub-tropical deep-ocean areas. Such profiles may be divided into arbitrary layers, each having different characteristics and occurrence (Figure 2.7). Just below the sea surface is the sonic layer where the speed of sound is influenced by local changes in heating, cooling and wind action. The base of the sonic layer is defined as the sonic layer depth (SLD), which is associated with the near-surface maximum in sound speed. This surface layer is usually associated with a well-mixed layer of near-isothermal water. Oceanographers refer to this well-mixed region as the mixed layer. The base of this layer is then termed the mixed layer depth (MLD). Below the mixed layer lies the thermocline, a region of the water column where the temperature decreases rapidly with increasing depth. This region is characterized by a negative sound-speed gradient (i.e. sound speed decreases with increasing depth).